Watching TV and playing games while wearing virtual reality headset is more immersive than compared to 2D format. The glasses carry you to the inside of events as if you were actually there. As a matter of fact, content producers are now shooting films in 3D format. When these glasses were introduced to the masses, they were surely costing an arm and a leg. But competition among manufacturers has brought their prices down. And that’s why there has been a sudden increase in demand for 3D virtual reality glasses. You can really get immersed in events even when you’re surrounded by people because it’s only you that can see the movie or show. The good thing with these glasses is that they are compatible with smartphones. You can therefore play games and watch movies when you’re away from home. Nowadays, there are few people that are going to the movies because it’s cheaper and convenient to watch HD movies on your phone than beating heavy traffic on your way to the theater. As long as your device is connected to the internet, you’re guaranteed of getting latest apps and games from Google Play store and Apple App store. You can even plug in your earphones so that you are able to adjust the sound volume to a level that suits you. There are many headsets in the market. Some are better than others, but at the end of the day, you want to settle on 3D glasses that are worth your money. You should go for a headset that has a T-shaped headband. Such a headband makes the glasses lighter on your head because the weight is diverted from the forehead area. Moreover, the straps should be adjustable so that the glasses can be used by different people when you’re not using them. A nice virtual reality headset should come with adjustable focal distance and pupil distance. If these features are missing, it will be difficult to use the glasses because there will not be enough space for the eyes. There should be buttons on the sides and at the top of the headset for changing focal and pupil distance. Besides that, the face of the glasses should be cushioned with a soft material such as leather or foam. This prevents irritating your skin around the eyes and the nose bridge, especially in users that spend many hours playing games or watching movies. 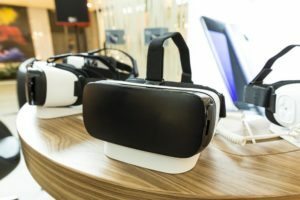 A good virtual reality headset should be supported by a wide array of smartphones. This means that you don’t have to buy a separate pair of 3D glasses for every brand of phone you have. You should ensure that the headset you’re about to buy is compatible with smartphones that run on iOS, Android and Windows operating system. A headset that’s constructed from ABS plastic is lighter and has a long lifespan. This is because it can never shatter upon falling on the floor accidentally or being bumped on when you’re traveling. Additionally, there should be a magnet adsorbed front cover to prevent dust and other debris from occupying the surface of the lens. In most headsets, the front cover is not permanently fitted so that you can remove it. If you wear prescription glasses, you should choose a headset that lets you wear them on top. There are some headsets that can be worn with contact glasses. If you suffer from myopia, there are 3D glasses that are specifically designed for such users. You can therefore remove your glasses when using such headsets because they have a view angle of 95 to 100 degrees. Most 3D headsets don’t come with a carrying case. If you really need one, it’s recommended that you settle for a package that includes it in the deal or be ready to buy it separately. 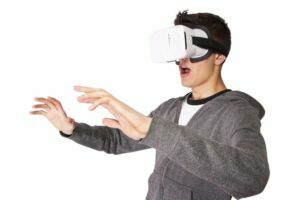 So, we have gathered together a useful list that contains the best vr headsets in the market. 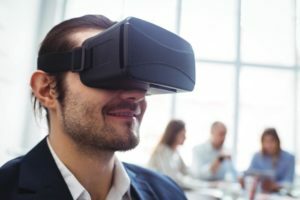 To simplify things for you, we picked the 10 best vr headsets in the market followed by brief reviews and features to assist with gaining more knowledge on what you want to purchase. Intcrown 3D VR headset allows you to visit different parts of the world in visualized imaginations. When you watch HD movies and play games with these glasses, you feel like you are part of the cinema cast.The glasses basically convert your smartphone into a big screen so there is no difference between you and those at the theater. The glasses are worn on the head via three straps that are also adjustable so that they can fit on any head. The headset is designed to work with devices that use Android, iOS and Windows. In fact, any phone that has a 6 inch screen can be used with these glasses. This headset is very convenient because you only need to download movies from the internet or get games and apps from Google Play store and Apple App store. You can even change the focal distance and the pupil distance. The lenses are secured by a removable cover that’s magnet adsorbed. The face mask is padded to avoid straining especially when you wear the glasses for many hours. Wide compatibility: Can be used on any phone that has iOS, Android or Windows. Highly portable: Made from light materials. Adjustable focal and pupil distance: There are knobs on the sides or configuring object distance. Front cover: A magnet adsorbed cover shields the lens from potential damage and provides ventilation. Hundreds of apps and games: Enjoy unlimited access to apps and games at Google Play store and Apple App store. T-shaped heaband: Comes with adjustable straps for users with varied needs. Padded facemask: the face is covered with soft leather to make it gentle on nose bridge and areas around eyes. 8 layer nano coating: Makes the lens resistant to radiation. The headset doesn’t come with a carrying case for transporting the glasses. You therefore have to buy it separately. Besides that, the 3D glasses don’t come with a bluetooth remote control. ou can wear these glasses for long hours because their face is covered with soft leather. There is enough allowance for your eyes due to the fact that the focal and pupil distance can be altered. You can actually wear the headset over prescription glasses. With Homido Virtual Reality headset, you can never be tethered around your TV. Any smartphone that has a 6 inch screen is enough for you to immerse into the world of virtual reality. The headset gives you the power to visit places you have always wished to go. The 3D games are so realistic because you are able to dive into the scenes. There is so much to be enjoyed with these 3D glasses. For a start, there are thousands of apps and games that can be sourced from Apple App store and Google Play store. The headset comes with a headband of three points. The headband is made to be adjustable so that it can be worn by either user stress free. In fact, the upper strap is removable. Besides that, the headset can be used with different phones because it supports Android, iOS and Windows. Those that wear prescription glasses can put this headset on top or remove them. This is because the glasses guarantee a 100 degree field of view. And that’s not all because the glasses are fitted with knobs on the sides for setting the focal and pupil distance. The face mask remains comfortable on the face of the user because it’s padded with soft foam. Front cover: The lenses are covered by a magnet adsorbed lid that is also removable. 3D games, movies and apps: Download apps and games from Google Play store and Apple App store. Light: Made from ABS plastic material. 100 field of view: The headset can be used by people with myopia without prescription glasses. Three point headband: The glasses have expandable straps and the top one is removable. Comfortable face mask: The face of the glasses is padded with foam to make it gentle. Adjustable focal and pupil distance: The glasses have knobs for setting focal and pupil distance. Wide compatibility: Supports iOS, Android and windows operating system. Since the package doesn’t come with a carrying case, you have to budget for it because it’s sold separately. Besides that, the headset lacks a bluetooth remote control and is costly. Homido Virtual Reality headset comes with an elegant design. The glasses give you the power to enjoy 3D games and movies with just a smartphone. The headset actually puts you in the same league with those who frequent theaters. The good thing is that you can watch your favorite TV shows and movies day and night without freaking out because the face mask is padded with foam. You can never strain your eyes because the focal and pupil distance can be altered. There are currently over 100 customer reviews for Glyby 3D VR glasses on Amazon. The headset lets you watch HD movies and play 3D games no matter where you are. It’s therefore your ultimate entertainment companion while you’re on the go. You can never run out of content to use with these 3D glasses because there are tones of apps and video games at Google Play store and Apple App store. The headset can be worn for extended period of time because the face is cushioned with foam to bring you comfort. The headset is fitted with T-shaped headband that is ergonomically designed to accommodate people with varied needs. Whether you have a small or big head, one set is enough because the straps can be adjusted. You can stream videos from any smartphone that uses either Android, Windows or iOS. Advanced HD technology: Guarantees HD movies and 3D games of high quality for maximum immersion. Ideal for heavy users: The face mask is padded with foam to avoid irritating your skin and nose bridge. Wide adaptability: Compatible with phones that run on iOS, Windows and Android. 18 month warranty: The headset can be repaired or replaced if it breaks down within a span of 18 months. Ergonomic design: Comes with three point straps that are expandable. Focal and Pupil distance: The focal distance and pupil distance can be configured via the knobs on the sides. Front cover: The headset comes with a front cover that can be removed to keep it ventilated. Durable: features ABS plastic construction. Free remote control: package includes a bluetooth remote control. There are concerns that the headset doesn’t come with its own carrying case. You’re therefore recommended to set some money aside for buying the casing. Alternatively, you can slide it in your traveling bag when going out of town. Glyby 3D VR glasses brings virtual reality wherever you are. All you need is a smartphone that supports Android, Windows and iOS. The glasses keep you going even when the going gets tough because the face mask is covered with foam. The headband has adjustable straps so that it can be worn on any head stress free. There are buttons on the sides for setting focal and pupil distance. You can pair these 3D glasses with prescription glasses because they’re spacious. Sokad 3D VR glasses will take your gaming experience to another level. You will experience fun filled moments that will leave you thrilled. With just a functional smartphone, no city is too far for you. Immersions will be your lifestyle because you will be able to go deep into the heart of action and drama. The headset is very easy to use. Simply download HD movies and 3D games to start enjoying virtual reality. The T-shaped straps makes these glasses suitable for everyone that fancies virtual reality. One pair of glasses can be used by different people due to the adjustability of the headband. Even users with myopia can use this headset stress free because it offers a perfect angle of view. The focal distance and pupil distance can be configured to the preference of the user. Light: the headset is not heavy due to ABS plastic construction. Supports different phones: Compatible with devices that use iOS, Android and Windows. Remote control: Package comes with a bluetooth remote control. Padded face mask: Glasses can be worn for many hours without irritating the user. Adjustable focal and pupil distance: The headset has knobs for regulating focal distance and pupil distance. Ergonomic headband: The headstraps have length can be increased to suit different users. Removable cover: The glasses are fitted with magnet adsorbed cover for ventilation. 95 to 100 degrees FOV: The glasses can also be used by people with myopia. The remote control may not work with some smartphones. The headset lacks a bag for carrying it when you’re traveling. Sokad 3D VR glasses is a deal worth trying. It’s fairly priced and comes with amazing features. The headset works well with smartphones that are operated through iOS, Android and Windows operating system. The T-shaped headband distributes the weight away from the forehead. The glasses can be worn by anyone who values virtual reality because they have adjustable straps. The headset comes with default focal and pupil distance settings that can be changed using the knobs on the sides. Pop-Tech 3D VR headset is designed to be compatible with various smartphones that run on Android, Windows and iOS. You therefore don’t have to buy it for a specific phone. With this headset, you get a 1000 inch big screen from a distance of just 3 meters. There is no limit to the fantasies that can be explored with these 3D glasses. There are hundreds of games and apps that are available at Google Play store and Apple App store. The headset comes with a stylish snap-in phone holder to protect it from falling off. The lens are free from glare because they are made from resin material. In fact, you can change the position of the lens so that they don’t come into contact with your eyes. People with myopia can also use these glasses because they have a wide angle of view. The headband is designed to be used by various people. Simply adjust the band and it will fit on any head perfectly. Easy to use: The headset is compatible with devices that run on Windows, Android and iOS. Snap-in holder: holds the phone firmly. Free remote control: Bluetooth remote control for your gaming needs. High quality lens: Resistant to electromagnetic radiation. Comfortable headband: Comes with adjustable straps. Allows you to use earphones. Adjustable lens: Pupil distance and focal distance can be changed using side buttons. Spacious: The headset can comfortably accommodate prescription glasses. Cushioned ace mask: The face is padded with foam to enable you wear the glasses or many hours. You have to buy a carrying case because it’s not included in the package. The remote control may not be compatible with some brands of smartphones. You’re therefore advised to buy a universal remote control. Pop-Tech 3D VR headset is an amazing headset. The headset comes with a snap-in holder that prevents your device from falling off. The focal and pupil distance can be altered to match with your optical needs. The headset can be used by various people at different intervals because it has an adjustable headband. The face mask is very gentle because it’s covered with foam to make it comfortable on your nose bridge and the areas around your eyes.